The Ten Plagues is one of the most exciting parts of the Passover Seder for children. 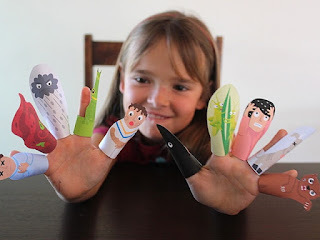 Kids love acting out the plagues, and these finger puppets are just the thing to get them involved and learning more about the Passover story. Print them out, cut them out, tape the small tabs together to fit snugly on little fingers, and voila! You've got ten little plagues of wiggly fun.